Mitchell delays his return trip to Israel while the US is waiting for Netanyahu to respond to questions on new housing for Jews in Jerusalem. 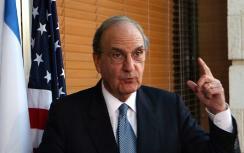 U.S. Middle East envoy George Mitchell has delayed his scheduled trip to Israel on Tuesday while the United States waits for a formal response from Prime Minister Binyamin Netanyahu on his intentions concerning a building project for Jews in Jerusalem. The government announced last week that another stage has been completed towards building 1,600 housing units in northwest Jerusalem's Ramat Shlomo neighborhood populated entirely by Jews, a part of the capital restored to Israel in the 1967 Six Day War which the United States does not recognize as under Israeli sovereignty. U.S. President Barack Obama is behind the public chastising of Prime Minister Netanyahu over the housing plan, according to the New York Times. His handling of the diplomatic crisis with Israel is being increasingly criticized in the United States, with reporters confused following different signals by different American officials. He refused to relate to suggestions that Clinton had demanded that the building project be halted. It is estimated that at least two more years will pass before all the permits are signed for work to begin. As for the timing of Mitchell’s trip, Crowley said, “This is a fluid situation. As of this moment, he’s still in the United States. But we want to make sure that in scheduling the next round of talks, that we have an environment that allows us to move the process forward." The Obama administration apparently is not making any effort to tone down the rhetoric against Prime Minister Netanyahu, and American political analysts have commented that the president may be trying to topple the Israeli government. White House political advisor David Axelrod on Sunday called the announcement by Israel of progress in the Ramat Shlomo project an "affront" and an "insult," surprising Israeli government officials who expected calmer words. American Jewish and non-Jewish groups have rallied to the side of Israel, charging the Obama administration with miscalculating widespread Israeli opposition to American efforts to create a de facto Palestinian Authority claim to parts of Jerusalem.